Thanks for making our four day Val D'Orcia Dream Casual Tour memorable beyond our expectations. All that was promised was delivered and more!!! Robin, Lian and I were smiling ear to ear the whole time! Jodie, as our pre-ride contact person, helped us pick the right tour for our budget and scheduling needs. And Marco, your expert advice gave me the confidence needed to enjoy the biking, Tuscan style. You tailored this private tour to our capabilties and gave us red carpet treatment! I hope to book with you again in the future. By the way, my husband's brother and girlfriend had a great ride around Florence with Elena on one of your single-day tours this last week and I was envious! 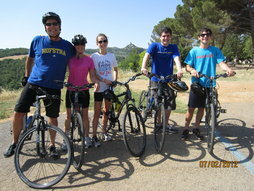 Thanks again for a wonderful bike trip and remember your invitation to stay with us in Jerusalem. Hello there, Jodie and Marco!! Finally, here are a few shots of the Monaghan clan on their bike trip through Tuscany Jun 29 – July 2. Biking through Tuscany with Marco and Jodie was the highlight of our family’s Italy vacation. Obviously, the landscape was beautiful and awesome, but it was the individual care given by Marco and Jodie that made the trip. Italy was in the middle of a heat wave when we were biking and they offered options to handle the heat; final itinerary always up to us, but they easily changed things up a bit as needed. We always had the best tables in the restaurants with magnificent views; everyone seemed to know Marco! Thank you guys so much!